Have you ever dreamed of taking something ho-hum and making it amazing? Do you watch makeover shows and wish you could be a part of a big transformation? Have you ever obsessed about a project so much that you could just ‘taste’ it? For us, yes to all 3! But the best part is…we actually got to do it! Chantelle and Jill ready for action! 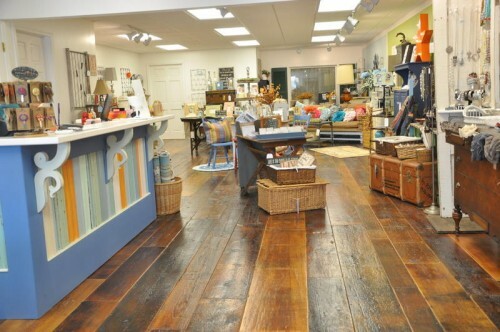 After purchasing the building, we were pretty adamant about the store needing a wood floor. We were, you could say, obsessing! We had a vision and the interior of the building was just lacking. Don’t get me wrong, we were grateful for a clean ceiling, newer track lighting and undamaged drywall but the industrial carpet was blah and the whole place needed some magic. And then it happened! We got a call. It was as if God himself had heard our pleas and answered our prayers! A friend of Chantelle’s Dad called and said his daughter had bought a new home with a barn that needed to come down immediately and did we want it? WHAT? IS THAT A REAL QUESTION? YES!!!!! I think I actually danced when I heard. The barn prior to take down! Now, if you want something done AND done right, enter the Carpenter/Deimling clan. 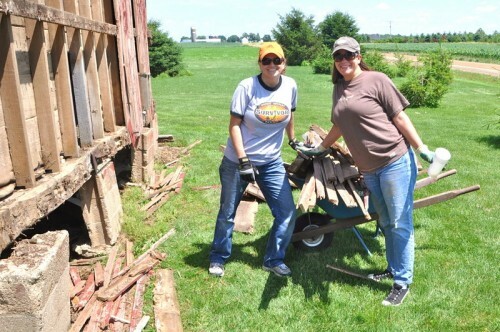 We all headed to the site and board by board, day by day, nail by nail the barn came down. After yanking on boards, saving some baby birds, enduring a broken finger (Chantelle), dodging spiders and running for a tetanus shot (Chantelle, again!) it was ready for the final frontier! From old weathered barn wood, to neat stacks of de-nailed lumber, it went into piles in the back of the store. After way too many dinners of ice cream cones, late nights until we ached, the real process began that included some serious math and countless tubes of liquid nails. The floor was laid and the polyurethaning began. Six coats later (some on our hands and knees), a lot of waiting, some actual crying, the floor was finally done! Can you say FABULOUS? Because I can and it is! As every good story goes, there is always more to it! Check back to see what else we ‘discovered’. And if you ever wonder if prayers get answered, they do! 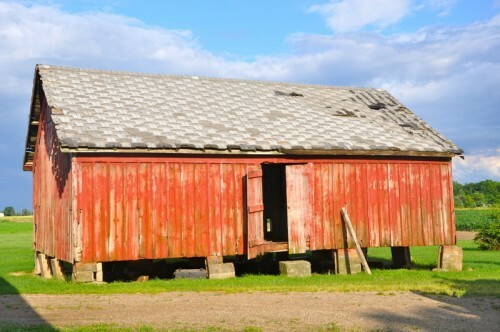 We have living proof that we walk on everyday and oh, yea, that barn…it was the perfect size! We had just enough wood to finish the floor, without a board to spare! And that, my friends, is what they call, “meant to be”! I love visiting B47! Very nice write-up. Every time I visit or have to pick up my daghtuer from MSU I have to make a side trip. I wish I could go to their painting workshops, but I too live too far. Another good place to stop is the antique mall right off 96 and there’s another mall just outside Williamston on Grand River on the way to MSU. The prices at Bungalow 47 are better than the malls though.